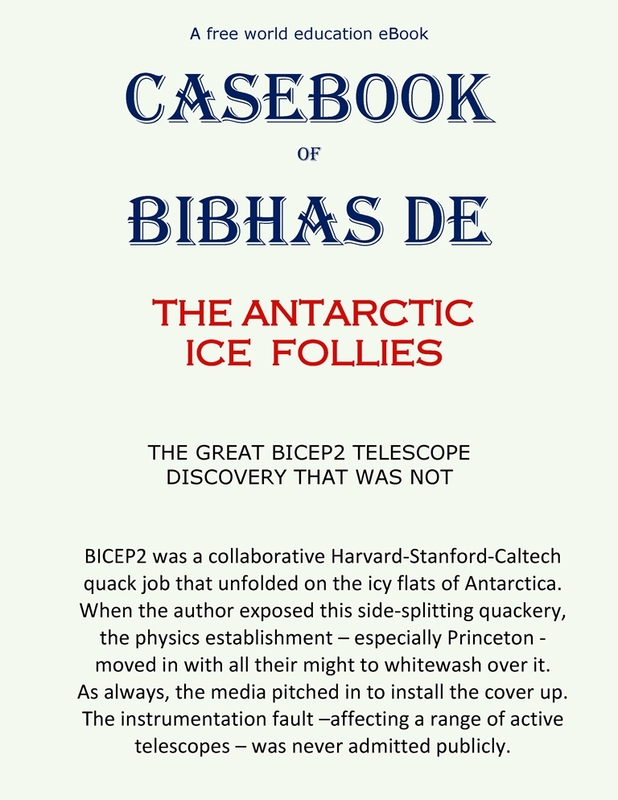 Why is Bibhas De so pissed off with the physics establishment?! 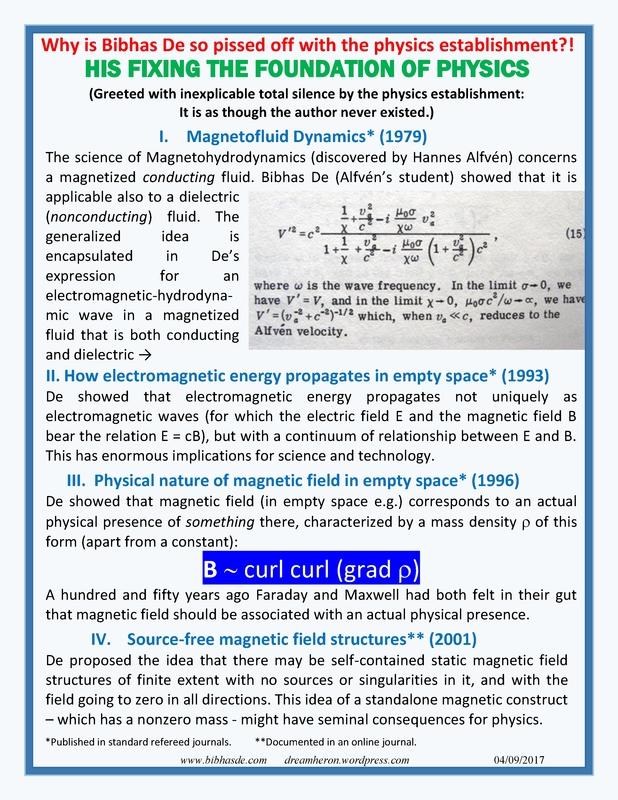 Part of the reason why I am so pissed off with the physics establishment is the following. I consider this collective scientific misconduct by the establishment. 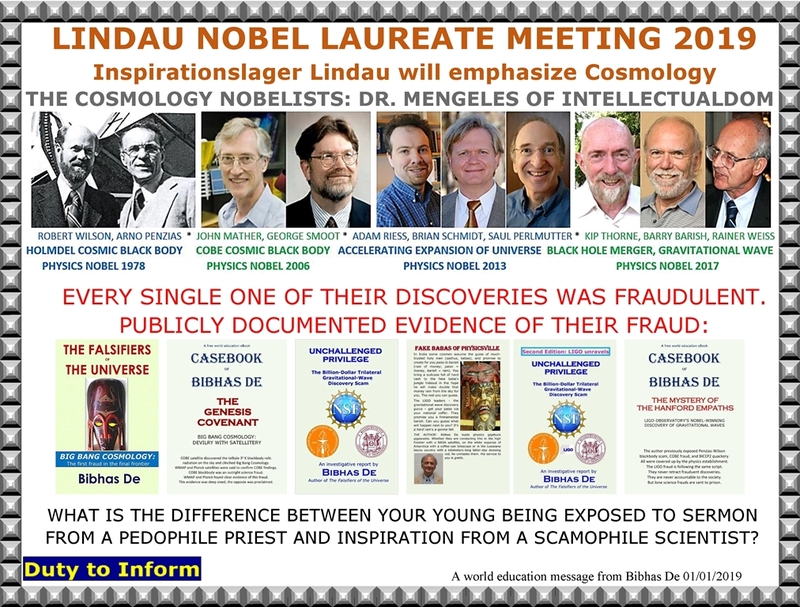 So, naturally, when they indiscriminately spawn scam science and fraud science and frou frou science or when they engage in group intellectual masturbation, I am predisposed to exposing them. In the following the text in italic font is the Federal Policy On Research Misconduct as promulgated by the American Physical Society. The text in regular font shows my comments interjected. Based on the operating principle of the existing LIGO instrument, a match between the recorded LIGO output waveform and a theoretically modeled gravitational wave train emanating from a merger of two black holes is no scientific evidence of gravitational wave . Such a match – however impressive it is – is scientifically irrelevant. 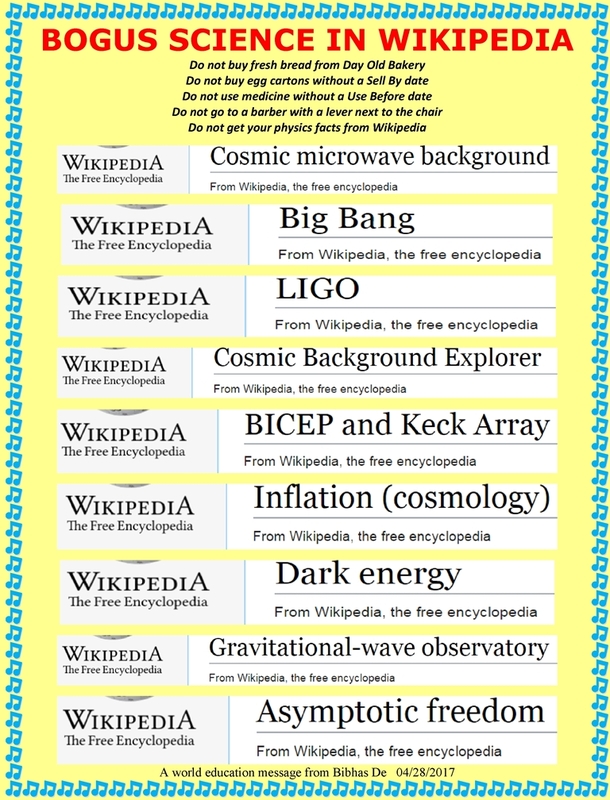 In other words, LIGO is not a complete scientific instrument concept. A complete instrument concept would measure and report three waveforms: the conventional output waveform they have reported (the “Difference Waveform”, say), and two waveforms showing the “displacement” of the two mirrors. If these two waveforms (“Twin Waveforms”, say) are identical except that one is flipped vertically, then this is the proof that a gravitational wave has passed through. The Difference Waveform now can be used to do the black hole stuff and whatnot. However, the Difference Waveform is actually a derivative of the Twin Waveforms, and hence the latter waveforms would be the primary LIGO measurements. 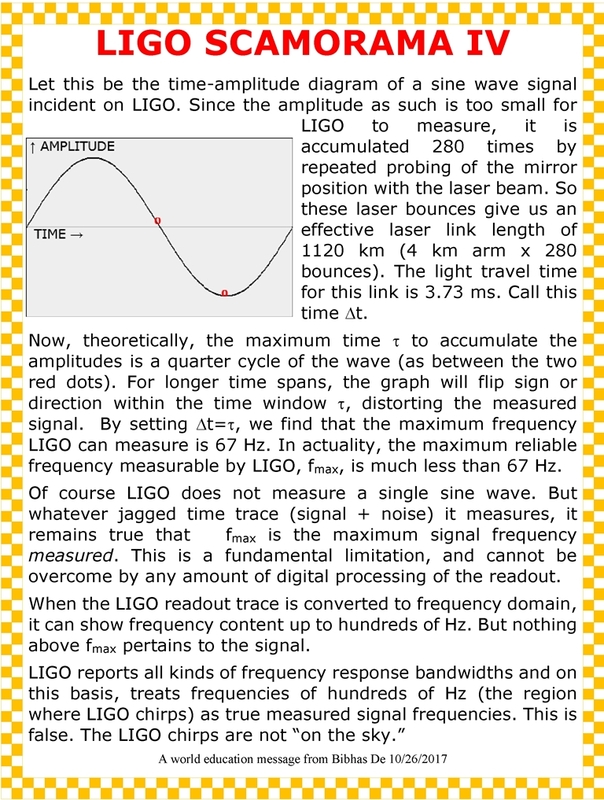 To be absolutely clear on this central point about the billion-dollar, multi-decade, thousand-man LIGO observatotry: If LIGO were an instrument that reported only the Twin Waveforms and they were as described above, we have evidence of a gravitational wave; if it reported the Twin Waveforms AND the Difference Waveform, we have evidence of gravitational wave AND black holes merger; if it reported only the Difference Waveform, then we have nothing. Absolutely nothing. This last case is what actually happened. Finally, for the LIGO instrument the Twin Waveforms may be fundamentally indeterminate, making this concept totally worthless for any purpose. So the total fabrication here is the false “scientific” premise that a match between the black hole merger theory waveform and the Difference Waveform leads to a simultaneous discovery of gravitational wave AND black holes merger. 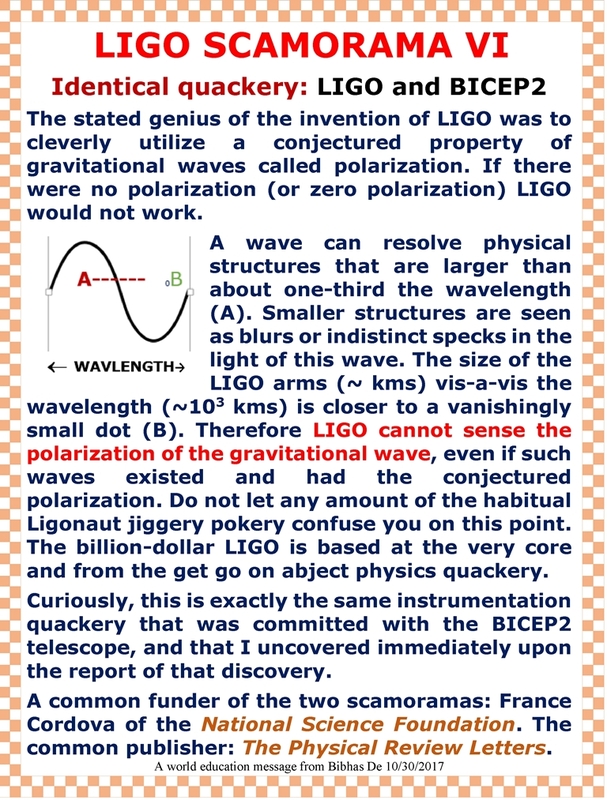 Another total fabrication is to aver without any experimental evidence whatsoever that the LIGO instrument can detect displacement of the 30-kg pendulum mass as small as 1/10,000-th the diameter of a proton. The discovery actually rests on this fabrication. The calibration of the LIGO instrument – which was an essential condition for the discovery – was falsified. No valid calibration data that pertained to the LIGO instrument as it existed and operated at the time of the discovery were ever presented – to this day. Instead, some old and flawed test was dusted and passed off as calibration [1,2]. An uncalibrated scientific research instrument is untrustworthy in all respects, and certainly cannot produce a discovery. To be absolutely clear on this point: No calibration, no discovery. We are way past the stage in the scientific process where honest error/mistake could be advanced as a reason for reporting the false discovery. Seven months have elapsed since the report of the discovery. During this period an enormous amount of scientific documentation of the fault with the discovery has been placed in readily accessible public view. 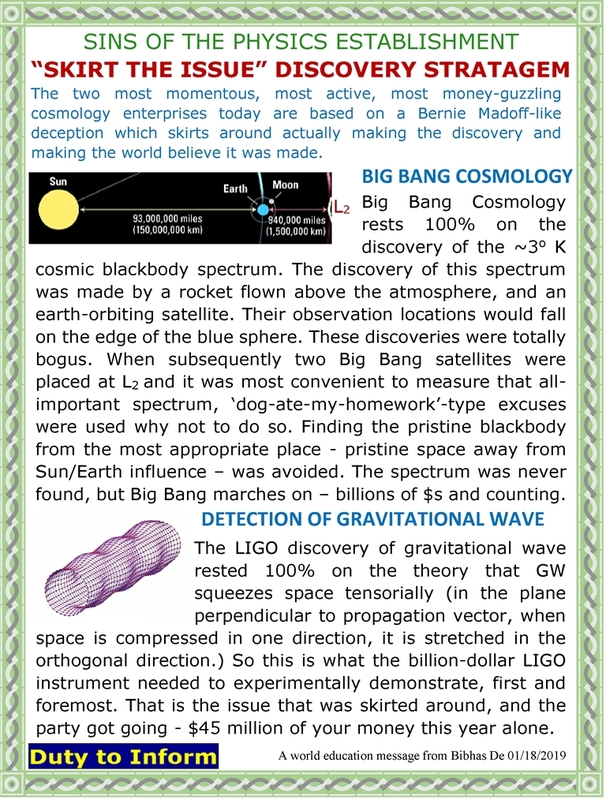 Had there been the slightest indication that the LIGO team was reviewing this material, it would be another matter. Instead, the raucous partying has continued and grown uninterrupted. 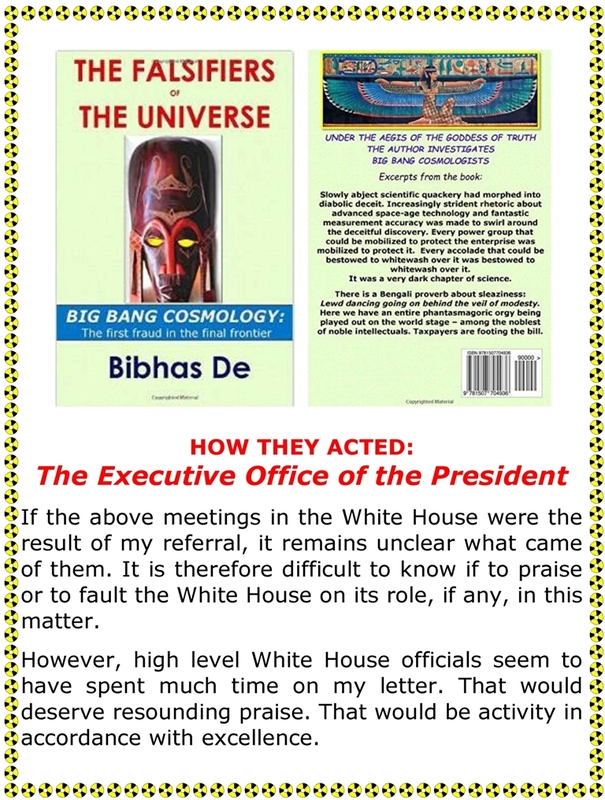 The lead LIGO operatives have been anointed, feted, and given enormous amount of moneys to be put in their personal bank accounts. The operatives have publicly accepted all these in the spirit they were given. In the end, on 11 November 2016, it was announced the LIGO’s official Spokeperson – acting in that capacity – will reaffirm the discovery in its fullest glory . Falsely averring under an elaborate ruse that an instrument was properly calibrated during the discovery is not and accepted practice of the community. To subsequently refuse to elaborate on this pivotal point when requested to do so is also not an accepted practice . To report a discovery where a mathematically ill-posed problem becomes an experimentally sound problem is not an accepted practice . To report a discovery based on a single detection of a transient signal is not an accepted practice. So solid was this discovery claimed to be that unprecedented demands for an instant Nobel Prize were made in all seriousness, demands that would require the Nobel Foundation to wave its nomination deadline. Even if the misconduct was unintentional (stemming from what has to be gross and collective incompetence) when the discovery was reported, the failure to retract the discovery and instead to forcefully maintain it made it intentional, knowing and reckless after the fact. Further example of this recklessness is the US-India LIGO Collaboration which, during the period in question, has been moving aggressively and hurriedly to take such concrete steps as would be difficult to reverse (such as acquiring land for the Indian LIGO). Starting immediately after the discovery report and continuing for months, independent scientists have documented evidence of fault with the LIGO discovery. These findings cover various scientific and engineering facets of the discovery. Because the instrument is fundamentally flawed, its symptoms are multi-faceted, and that is why various investigators have described various fatal faults [1, 2,6-8]. (4). 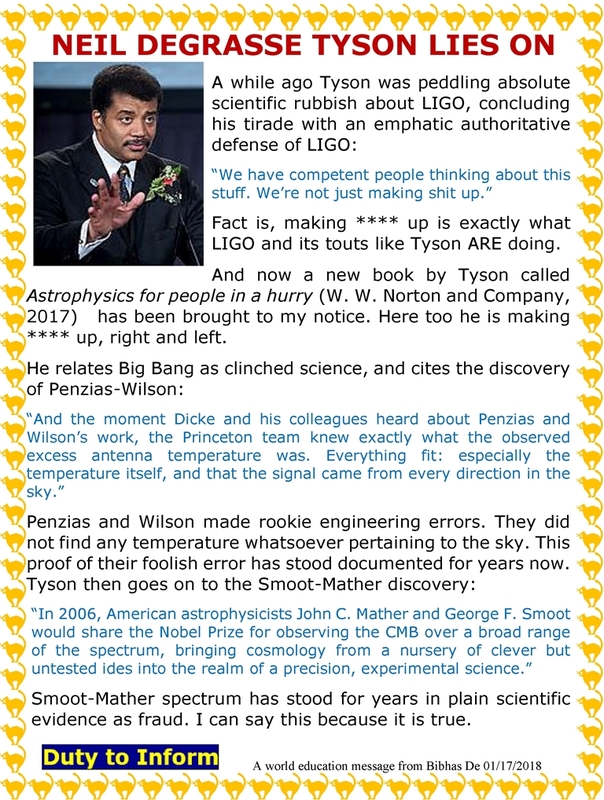 The interpretation of LIGO observation was flawed or scammed. There is also evidence that on the day the gravitational wave was detected, the various uncertainties with LIGO were at a heightened state, and malfunction occurred . There is also circumstantial evidence. Rainer Weiss is the LIGO instrumentation maven. He was also the COBE Satellite instrumentation maven. In fact the two projects overlap in time. 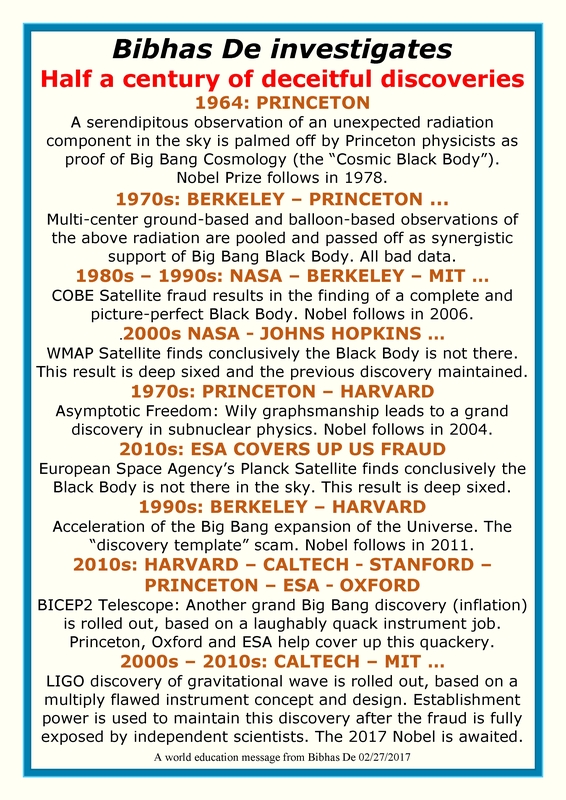 The COBE Satellite discovery was a fraud, rooted in the instrumentation. LIGO is an outcome of the same process. In fact, nothing about LIGO survives that proper scientific scrutiny which the physics establishment was unable or unwilling to provide, and which their watchdogs were happy to look away from. This scrutiny – the preponderance of evidence – in the end was provided by outsiders, gratis. Tags:Scientific misconduct, What did they know and when did they know it?